Due to their original development concept, MicroPC embedded computers are currently among those being the most resistant to the rough environment factors. MicroPC modules enable to promptly build cost-effective highly reliable embedded and automation systems. Special technology used for manufacturing processor cards and extension boards ensures their steady operation at the temperatures from -40 to +85°С, resistance to vibrations up to 5g and shocks up to 20g. Reliability of devices is provided by a range of technical solutions throughout all manufacturing and testing stages. A three-year warranty period is offered for all MicroPC devices. MicroPC CPU boards are distinguished by their compact sizes 124×114 mm. At the same time, the boards have high performance and an entire range of standard РС-interfaces, including Ethernet and USB. The four-point system of fastening MicroPC boards to ISA bus, ensures that the boards are firmly fixed from all the sides using connector, guide rails and securing bars, which absolutely eliminates sideways motion of the boards and protects them against shocks and vibrations. In addition, Hot Swap of the board is available. 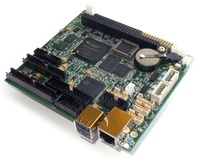 MicroPC boards are fully compatible with such embedded operating systems as Windows CE, Windows XP Embedded, QNX and Linux. The Module is implemented in MicroPC standard and is designed for switching of 32-x DC voltage up to 60 V at the load current up to 500 mA. The card is implemented in MicroPC standard, is equipped with 32-x channels and is designed for reading the states of digital signals or measuring frequency signals with voltage levels from 3.2 to 52 V.